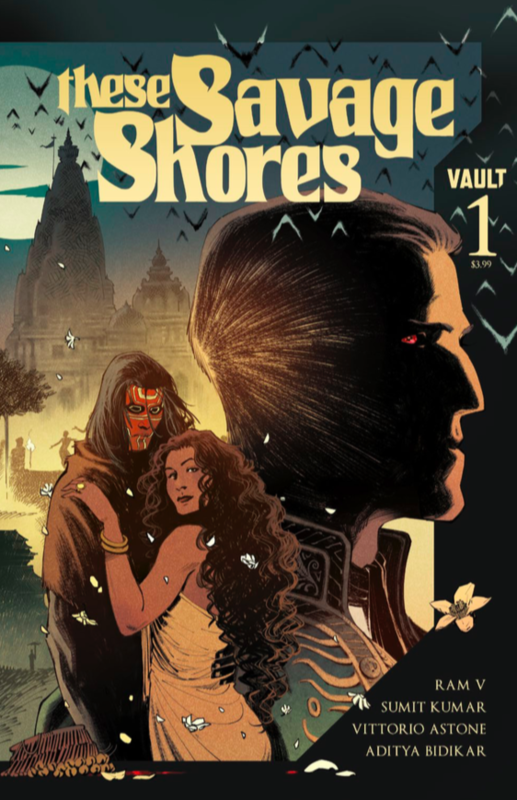 These Savage Shores #1 Review – AiPT! These Savage Shores is a promising horror historical fiction that will leave readers bloodthirsty for the next issue. Ram V., Sumit Kumar, Vittorio Astone, and Aditya Bidikar deliver a rich story and beautiful artwork. Horror fans and newcomers will find this first issue enjoyable and perfect for the Halloween season. The team sends us back to 1766 colonial India, but with a vampire twist. Alian Pierrefont is a vampire exiled to India for exposing his vampiric identity in public. He encounters Kori, who he wants to feed on, but comes to odds with Bishan. Kori is a dancer and Bishan appears to be a king’s bodyguard. Could Alian Pierrefont be a metaphor for Euporean imperialists “sucking” India of its resources and people? Could Bishan be a metaphor for India pushing back against such actions? These might be some questions that readers may come across as they read the comic. Ram V. helps place the Indian characters as powerful and independent in their own right. The characters do not revolve around or connect to in any way to the white British cast. Bishan is the most evident example of this. He beats Alian Pierrefont to a pulp after discovering Pierrefont attempting to harm Kori. Bishan can stand up to Pierrefont and the British imperialist with his own power. He does not fear reprisal because he knows he can defend himself. There is no white savior complex in this series. Even the title is fitting for the series. “Savage” in imperialist and colonial ideology is understood to be the native of the land. Ram V., Sumit Kumar, Vittorio Astone, and Aditya Bidikar paint the vampire Pierrepont and white British imperialist as the savages. The team does an excellent job of reversing the narrative. These Savage Shores combines all the stories I grew up hearing about colonial and ancient India. The British were always the enemies in the colonial stories and Indians as the heroes. Yet, they all ended with British winning. These Savage Shores holds that narrative, but hopefully, Bishan and Kori come out as the winners. The ancient India stories were full of religion, power, and lessons. Bishan is the embodiment of all three aspects. He is more than human, can beat up a vampire, is connected to the Gods and sages in some way. One lesson I pulled from Bishan was helping those in need as he saved Kori from Pierrefont. I wouldn’t be surprised if Ram V. expands and continues the inspiration of these stories. The artwork for the series is gritty and elegant. Sumit Kumar, Vittorio Astone, and Aditya Bidikar’s art capture the mood of each setting, London and India incredibly well. Their work freely flows from each panel and grid. I thoroughly enjoyed the team’s deception of Pierrefont’s arrival in India with glasses and an umbrella. It is a perfect representation of who he is in the series. Pierrefont is an outsider with hidden intentions in addition to his vampire status. Ram V., Sumit Kumar, Vittorio Astone, and Aditya Bidikar have created an enjoyable and engaging comic.